Breeding Habitat: Nests in farmyards, under bridges, in culverts, in rock outcroppings, and under eaves of buildings. Nest site is located near semi-open woodlands or forest edges, often near running water. Diet: Flying insects including wasps, flying ants, and bees. Also spiders, millipedes, and ticks. Small fruits and seeds during the cooler months. 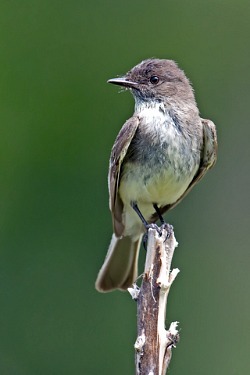 The Eastern Phoebe breeds throughout New England. 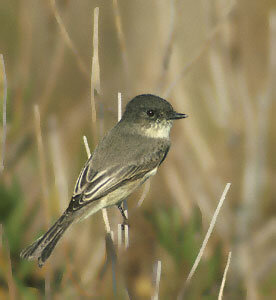 This bird winters mainly in the southeastern U.S. and parts of Mexico. The first spring migrants usually arrive in New England in March.